365 days in the life of an administration, organization or an individual might mean very little to many but to a political leadership/head that from the inception sets out with an eye single to bring development and economic empowerment to his people, 365 days provides adequate allowance to create a positive impact that can be concretely felt. In the life’s journey of an individual, government or organization/business, it is always imperative that along the way there should be a provision made for stock-taking, assessment which will aid the person or government to improve upon performance/achievements already recorded and seal perceived loop-holes, while at the same time using the period to commend and motivate members of the team/cabinet to drive on to the desired destination. It is therefore based on this premise that most leaders and heads’ governments mark 100 days in office and one year in office of an administration. 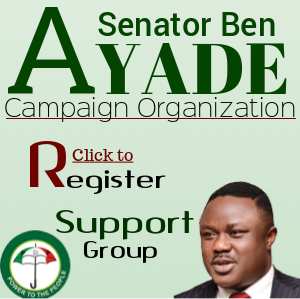 The administration of the incumbent Governor of Cross River, Senator Ben Ayade came into being on May 29, 2015 after it was inaugurated at the prestigious Calabar International Convention Centre (CICC) same day. 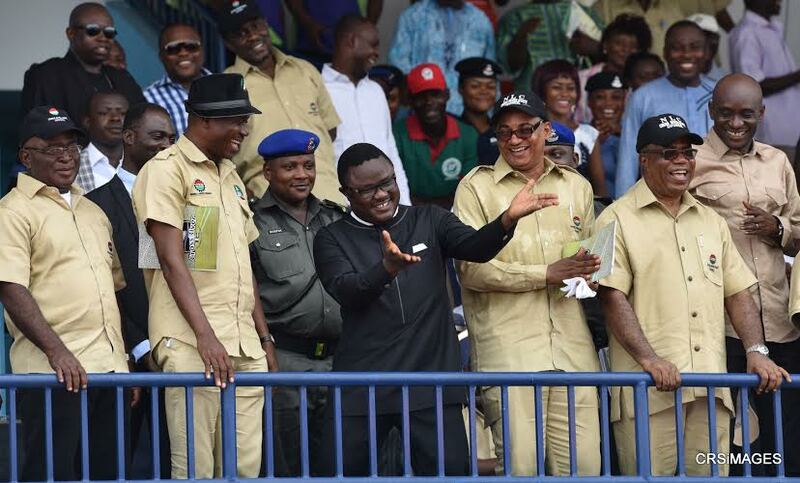 In his inaugural speech, Governor Ayade did not leave anyone in doubt as to the direction of his administration including the key projects he tagged “Signature Projects” (the super high Way and the Bakassi deep seaport) which he was to vigorously pursue among other projects like the garment factory and others. 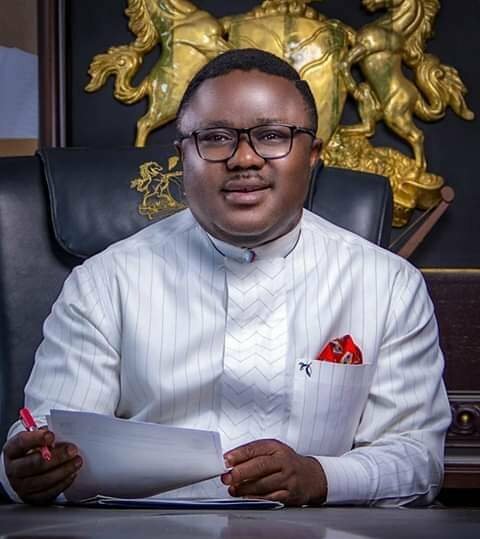 Ayade lucidly stated his avouch determination to equally channel energy and resources towards providing jobs for the people so they could afford to put food in the tables of their families, as well as ensure that Cross River and her people become economically self-reliance through the creation of a veritable alternative sources of income/revenue outside the fast dwindling revenue from the Federation Account. 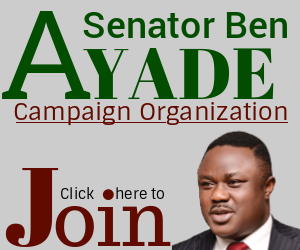 After 365 days in office as an administration, what are some of the areas in which the leadership of Senator Ben Ayade has been able to make giant strides? This is what this write up seeks to bring to the notice of Cross Riverians and other Nigerians as the administration marks a full one year in office. The brief achievements for the past one year cover all the major sectors/ministries/departments and agencies of government in the time under review. 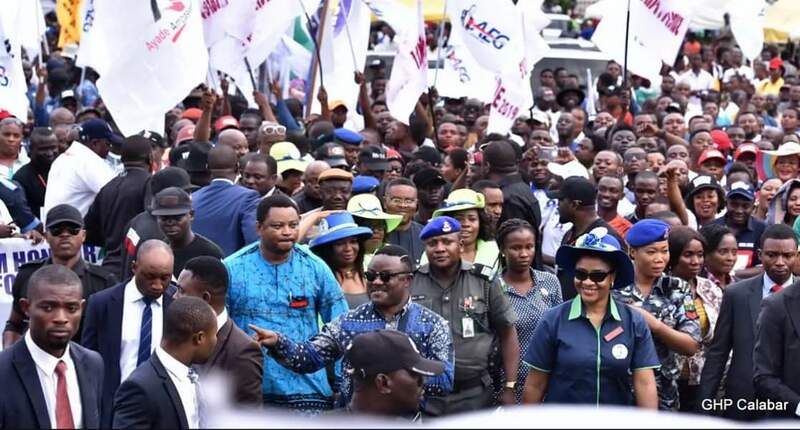 Under infrastructure/industry, the Ayade administration with Edem Inok Edem, (now the state PDP Chairman), has within 365 days commence and completed a garment factory which will employ 1,800-2000 workers, mostly women and widows and completed and commissioned the Calabar monorail. Bush clearing and technical details including the Environmental Impact Assessment (EIA) documents for both the Super High Way and the Bakassi Deep Seaport has been carried out and displayed for public reactions and comments. 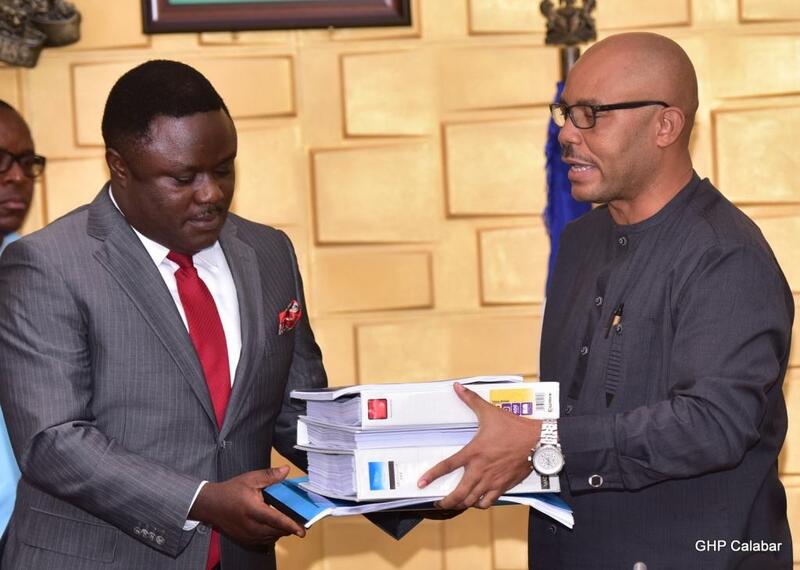 A Pharmaceutical Company, CALAPHARM, and Plans to host the first International Micro Small Medium Enterprises (MSME) in Calabar are also parts of the achievements recorded by the Ayade government within the period under review. With Professor Anthony Eneji as commissioner for Agriculture, under one year, work is ongoing in the Thai Rice City in Calabar, plans on top gear for the exportation of highly improved banana to the western world, especially Germany, a poultry farm in Ikom among others. The newly created Ministry of Climate Change being piloted by an amazon, Alice Olok Ekwu has completed the interview and recruitment of able body young men and women into the Green Police. A security monitoring outfit code-named “Operation Skolomb”, has been setup headed by Gen Nyiam. Under the Ministry of Commerce and Industry, headed by Peter Akam Egba, numerous MoUs have been completed with foreign investors targeted at changing the economic fortunes of the state and Cross Riverians through establishing a solid alternative means of revenue generation away from the Federation Account. As part of a deliberate policy direction to provide a solid legal framework and foundation for most of the development plans, including the building of 5000 houses for the poor and the low income under the social housing scheme, the Executive arm of government has sponsored several bills which have been passed into law, and the Ministries of Justice and Social Housing headed by Barr. Joe Oshie Abang and Edem Effiom played significance roles in this regards. In-depth study and prospecting for petroleum and gas resources have been carried out in the state with Hon. Itaya Nyong and Barr. Chris Njar as commissioners respectively, while effort for the development of new cities in the state and the development of rural areas are equally on top gear with Barrister George Ekpungu and Sunny Achunekang as Commissioners. Under Hon. John Ulafor as Commissioner for Local Government Affairs and Chief Peter Ojie as Special Adviser, Political, a successful Ward, chapter and also State congresses of the People’s Democratic Party (PDP) have been conducted, just as issues relating to the payment of Local Government staff and pensioners are being honestly addressed. The Ministry of Land Development under the leadership of Dr. John Inyang as Commissioner has equally put in place proper modalities on issues relating to land acquisition, Certificate of Occupancy, building among others to sanitize the system. The Information under Barrister Rosemary Archibong as Commissioner is not left out as the amazon worked to improve the quality of the state mass media as well as discipline among staff and the implementation of the Weigh-in allowance to Information and Newspaper Corporation staff. Under the Ministry of Health, the Ayade administration has within the period under review commissioned the General Hospital/College of Health, Obudu and a self-effort cottage hospital in Basang west on May 14, 2016, successful launching of Aisha Buhari’s “Future Assured” pet project at Ikom and the unveiling of Dr. Linda Ayade’s “mediatrix foundation, commissioned comprehensive Primary Health Care Centre in Ikom, had held regular stakeholders meetings with private health practitioners in collaboration with implementation partners (IPS) and trained their staff on data capturing and Health Information Management System among others. Other achievements of the Ministry are the creation of the state Primary Health Care Development Agency and the Climate Change department, revision of the state strategic Health Development Plan-CRSSHDP 2011-2020, establishment of Clinical Governance and e-health in all secondary health facilities as well as appointment of focal persons etc. The Agency for Community/Primary Health Care was created with Dr. Mrs. Betta Edu as Director General, while Dr. Mrs. Inyang Asibong presides over the ministry as Commissioner. Within the period, all UN/WHO Health related days were observed and celebrated, carried out the programme of Train the Trainers workshop, distributed long lasting insecticidal nets (LLIN) throughout the state, revised the curricular of health related schools and manual handbooks, provided scholarship to Nurse tutors and passed out of backlog of students from the school of Midwifery, Moniaya, Ogoja among others. Other monumental achievements recorded in the health sector within this period include the Successful implementation of Measles campaign (29th Jan – 3rd Feb. 2016.Implementation of 1st Round of Immunization plus Days (IPDs). (27th Feb. – 1st March, 2016). ; Implementation of 2nd Round of Immunization plus Days (IPDs). (19th – 23rd March, 2016); Implementation of 2nd Round 2015 Maternal New-born and child Health (19 – 23rd April, 2016); African Vaccination week at IDP camp Bakassi indigenes at Ikot Eyo Edem, Akpabuyo LGA. (27/4/2016); Need Assessment/ Health facility inspection, And Holding first town hall meetings on health in 5 LGAs. Advocacy to key stakeholders to ease PHC activities. (Obong of Calabar, NTA, CAN, NIS, Professional bodies etc. ); Renovation of Comprehensive Health Centre, Ikom; Renovation of Primary Health Care Centre, Obudu; Renovation and refurbishment of PHC, Bedia; Renovation and refurbishment of PHC, Anigejie; Commemoration of World Malaria Day. (25th April, 2016. ); Establishment of Primary Health Care Development Agency; Creation of PHC post at IDP camps (Akpabuyo and Bakassi; Creation of trans- border health post for disease surveillance and immunization coverage; Formation of TBAs surveillance team; Delivery of 10 direct solar refrigerators to 8 LGAs supported by EU Sign; Provision of 600 Delivery kits to 3 PHC facilities in CRS; and Free Medical outreach at Ugep and Ikom LGAs. Governor Ben Ayade’s administration has equally made positive inroad to the virgin area of solid mineral with the creation of the Ministry of Solid Mineral Resources with Mr. George Oben-Echi in the driver’s seat. Within the span of four months, the solid mineral ministry under Oben-Echi has concluded plans for the establishment of a Cement factory in Akamkpa which will be up and running by the end of 2016, concluded plans for the establishment of three quarries in Mgbenege in Obudu, Okubishi in Boki and Ojor in Akamkpa, just as the ministry has gone into partnership with PW to setup the quarries and mineral mapping and test across the state. The Solid Mineral ministry has also applied for quarry license with license number which will be secured before May 29, 2016; carried out sensitization campaign among solid mineral bearing communities on the need to avoid giving consent to anybody. 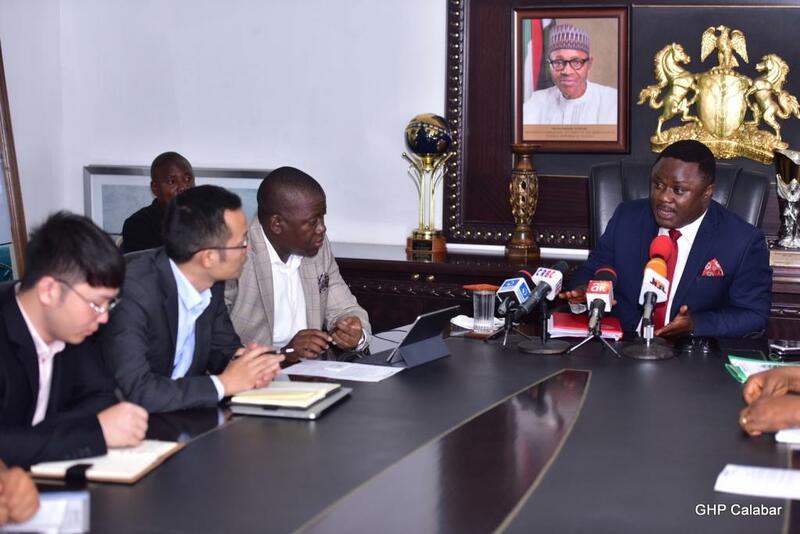 As a result of the good work being carry out by the ministry under the direction of Oben-Echi, are companies interested to set up ceramic and salt industries in the state with foreign investors showing much interest in the cement factory. The Senator Ben Ayade’s administration came into power last year at a time the Odukpani Junction, some portions of Calabar-Itu Federal highway, and Calabar-Akpabuyo-Bakassi Federal highway were equally in a very deplorable state. To assuage the sufferings of commuters and motorists plying these routes, the Ayade government carried out several intervention and remedial works on those portions. Deliberate efforts have also been made to fix several streets in both Calabar Municipality and Calabar south to ease traffic congestion and ensure more accessible routes within the capital city. In the vital sector of education, Governor Ayade appointed a committed administrator, a former Chairman of Yakurr and a highly intelligent man, Hon. Godwin Ettah to take charge of the secondary and tertiary level of the state education as the Commissioner for Education. In the year under review, the current leadership in the state ensures the restoration of the scholarship programme to bring back hope to many families and Cross Riverians of indigent background. 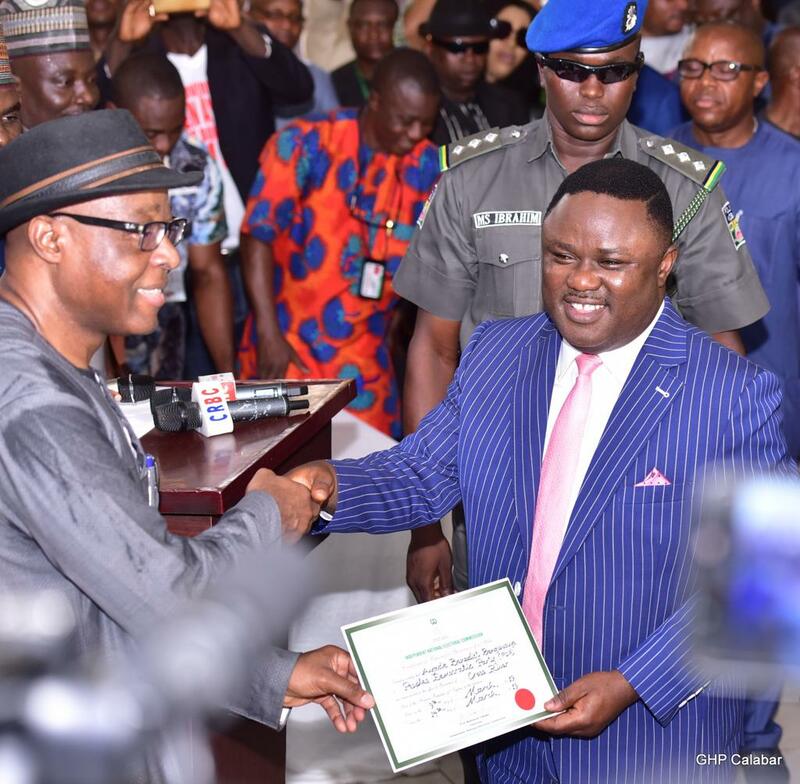 Hitherto to the advent of democratic rule in 1999, Cross River was abysmally referred to as an educationally disadvantaged state; but concerted efforts from then to 2007 miraculously changed the educational fortunate and rating of the state. Sadly however, few months to the exit of the last administration the ranking of Cross River in education performance went down to an unbelievable position 32 out of the 36 states and Abuja. To checkmate this situation at the foundational levels and reverse the ugly trend, Ayade brought in a seasoned educationist, and administrator par excellence as the Chairman of the state Universal Basic Education Board, Dr. Stephen Odey, to oversee the all-important basic education with the thinking that when the foundation/substructure is right, the superstructure will also be right. It was based on this premise that at assumption of office, Dr. Odey stated thus, “I am on rescued mission and my primary objective is to facilitate learning and improve the standard of basic education, and to transform the state Universal Basic Education Board (SUBEB). Other achievements in the education sector in the year under consideration include, the ongoing personnel audit of teaching and non-teaching staff’ Rehabilitation of three dilapidated SUBEB vehicles for effective monitoring and supervision; Procurement of 18,000 dairies, 18,000 registers for distribution to schools; Purchase and distribution of 18 desktop computers, printers, Ups and generators to Local Government Education Authorities to all the LGAs which was never in existence in the past 15 years and the organization of education stakeholders meeting to come out with the location of the proposed World class Model Schools in the three Senatorial districts. Construction of nine ongoing lavatories compartments in six locations, construction and rehabilitation of several schools across the state; Supplied about 348 chairs and 174 tables for teachers across the state; Earmarked 8,250 plastic chairs and tables sets for Early Child Care Development (ECCDE), primary and junior secondary schools pupils across the state which, 7,454 plastic chairs and tables have been delivered; Carried out the 2014 UBE Teachers Professional Development Programme workshop to improve capacity; Renovated the SUBEB Conference room, offices and the environs; Accessing the 2013-14 Special Education grants from UBEC as well as the accessing of the balance of the excess funds from UBE 2005-2007 intervention projects, hitherto unclaimed in the Central Bank with six more schools benefitting from accrued balance of the excess funds with sites handed over to contractors are also the achievements recorded in the education in about one year in office of Ayade administration. In the Electricity and Power sector, headed by Thomas Udam (Timmy Tom), some quiet appreciable successes have been recorded ranging from embedded generation in Obudu power plant; Hydro power in Ikom;; Gas turbine in Tinapa;; 30mva generators by skipper and Jumpaur across the state; 132 transmission line from Calabar to Obudu; purchase of over200tansformers of various sixes among other ongoing projects. Under the Ministry of Environment headed by Engr. Mike Eraye, all the necessary structure have been put in place to consistently tackle the daily generation of waste by the residents of Calabar and the environs after clearing the back lock of over three months non-evacuation of refuse prior to the coming to power of the Ayade administration. Besides, modalities are already on in collaboration with the Federal ministry of Environment to transform the waste generated daily in Calabar into wealth and create additional job opportunities for the youths of the state. With these modest achievements within a year, it is hopeful that in 1,460 days landmark achievements and developments would be recorded to the glory of God. I am glad to be a visitor of this unadulterated web site! , thankyou for this rare info ! .